LOS ANGELES — Captain Anze Kopitar scored the only goal in the shootout, and the Los Angeles Kings beat the Anaheim Ducks 4-3 Saturday night in a low-stakes edition of the Freeway Faceoff. Kyle Clifford and Jeff Carter also scored for the Kings, who have won back-to-back games after losing 16 of their previous 18. Cam Fowler and Rickard Rakell also scored for the Ducks, while Miller stopped 26 shots. Jonathan Quick made 17 saves for Los Angeles. 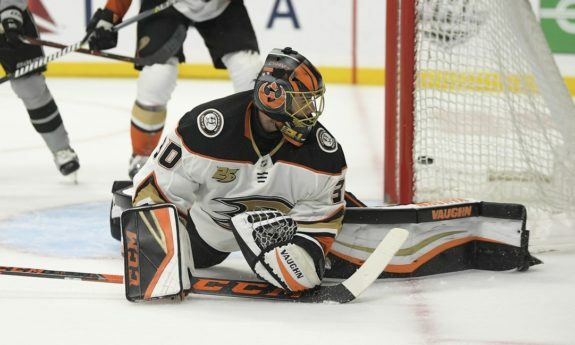 Although the Ducks avoided official playoff elimination by earning a point, the 140th Freeway Faceoff carried little of the past editions’ stakes or tension. Southern California’s NHL teams occupy the bottom two spots in the Western Conference, and they will miss the playoffs in the same season for the first time since 2004. Ducks captain Ryan Getzlaf and forward Nick Ritchie sat out with upper-body injuries. NOTES: LA hadn’t won back-to-back games since Feb. 5-7. … Ilya Kovalchuk and Dion Phaneuf were healthy scratches for the Kings. Kovalchuk is frustrated by his lack of consistent ice time, but the Russian star says he is determined to live up to the three-year contract he signed with the Kings last year. … Kings F Brendan Leipsic sat out with a lower-body injury that will keep him out for “a few days,” coach Willie Desjardins said Friday. … Ducks D Jacob Larsson missed his third straight game with a charley horse.